This evening ritual took place on August 6th. We arrived a bit early as the ceremony was supposed to start at 6:30. Well, this enabled us to get a good spot to wait and be ready to see the ceremony, the action, and take pictures. Some 50 arrow-like talismans were placed in the Mitarashi pond. It was daylight and we waited. People started to arrive and the place soon became packed. 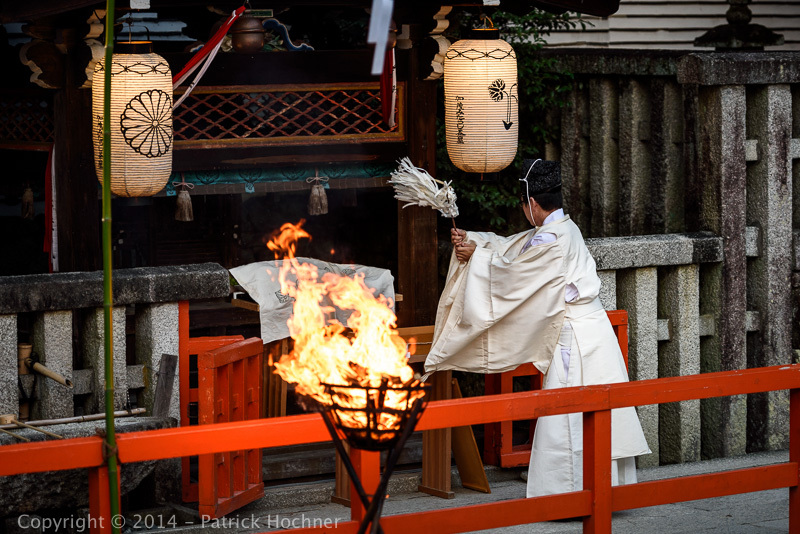 Not much happened for about one hour, then the shrine priests arrived, lighted wood fires around the place, and fixed one of the arrow. A few more priests arrived and started the ceremony, moving around, purifying offerings in front of an altar, and reciting what I think was sacred text. The participants, about 60 men (young and not so young) arrived, took position on both sides of the pond and waited for the priests to take care of the ritual, the benedictions and prayers. It was now night and the only light was from the fires around. At 7:20, four priests took position at the four corners of the pond, and the signal was given. 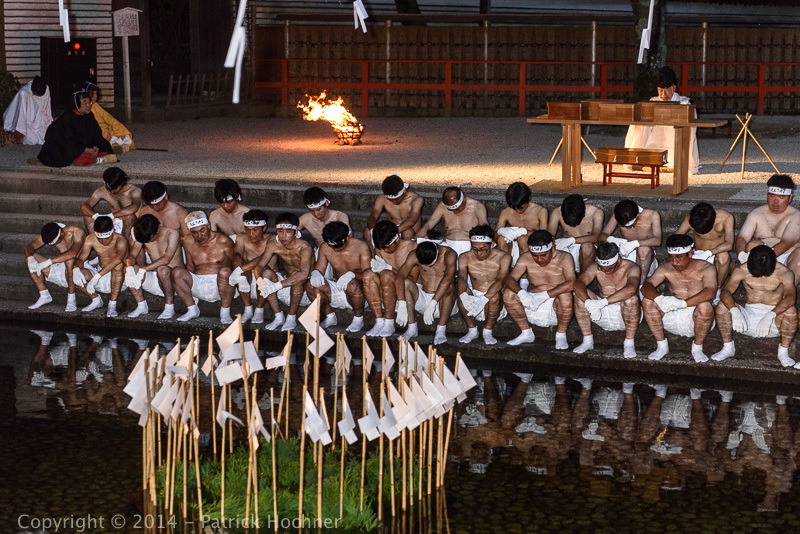 The men jumped into the water to retrieve the talismans that would ensure longevity for themselves while the priests threw hundreds of hito-gatta (paper shapes of human figures) around, into the water for them. Everything went very fast and it was over in a minute. This marked the end of Shimogamo’s summer celebrations. A “chinowa”, also called suganuki, a large ring made of cogon grass erected on the pathway leading to the entrance of Shrines, (usually in the Torii Gate) had been placed in Shimogamo’s Romon Gate. By passing through the ring, participants’ sins are washed away. We were told to pass twice into the ring, while drawing an 8. After passing through the circle, people usually break off a piece of the grass ring to take back to their homes. 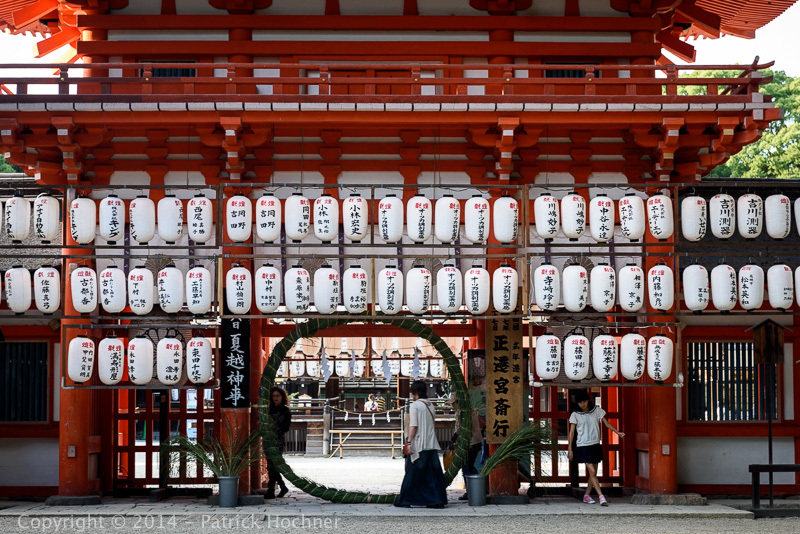 Chinowa rings are common to most shrines for the mid-year purification rites. 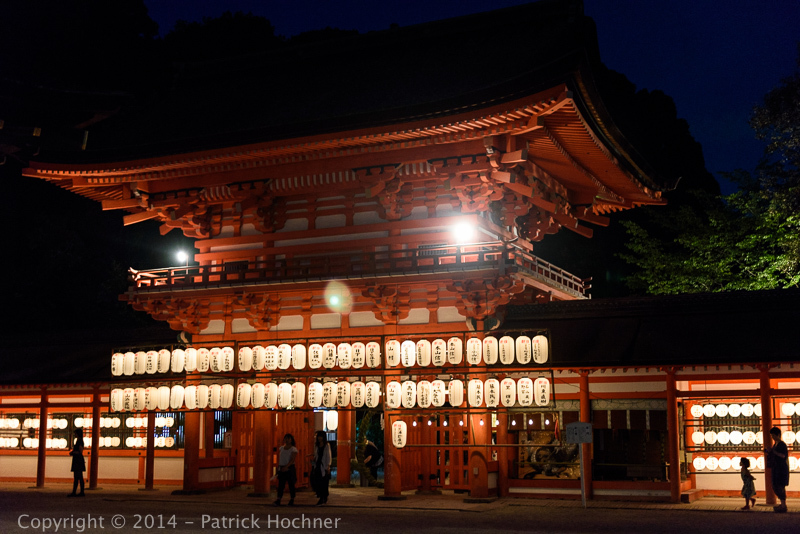 The Kamo Shrines (Kamigamo and Shimogamo) are among the most important in Kyoto. Shimogamo was founded by the Kamo clan (possibly of immigrant origin) and is ranked as one of the oldest Shrines in Kyoto. It is dedicated to two deities. Kamotaketsunumi-no-Mikoto is the tutelary deity of the Kamo clan. He is often represented by a 3 legged crow that allegedly guided the mythological Emperor Jimmu in his move from the west to the Yamato area.